Spaghetti metal. There's a genre the world wasn't crying out for. 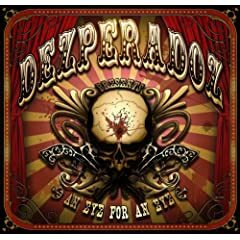 The Desperados, as they were, started out as a side project by Tom Angelripper from Sodom, way back in the hoary old days of 2000. By the time they re-emerged in 2006 for "The Legend And The Truth", they had become Desperadoz and Mr Angelripper was no longer part of the band. That album was surprisingly enjoyable. I didn't think I would take to it, the whole notion of a German Wild West metal band being a wee bit on the bizarre side, even for the kerrzy world of Teutonic metal, but it worked well. And it continues to do so. Again, Herr Angelripper is not part of the band, although he does crop up as a special guest on 'Here Comes The Pain', one of the weaker tracks on the album. It's still very much the baby of Alex Kraft, who writes, sings and guitars, and on the back of touring with Axxis and Krokus, there is more of a band fell, despite its project status. It's also a concept album - duck - about a man who kills his friend as an act of revenge and is condemned to death. Which seems fair enough. It's all fine rollicking stuff, bringing to mind bits of Zakk Wyldes Pride & Glory more than it does the classic days of southern rock, and there is less of the banjo pickin' and more metal this time around. It's a solid album, with a few highlights like 'May Heaven Strike Me Down' and 'Wild Times', although the note for note cover of The Doors' 'Riders On The Storm' is pointless. An enjoyable slice of metal from the leaders of their very own one band genre! And so it was, with heavy heart, that I took myself off to Glasweegie land for the second time this month, which as anyone knows is two times too many. But I had my protective clothing, and a recording of the local patois for when the usual array of motley ne-er do wells accost me with requests for money and / or a square go. Thanks to an unfeasibly early showtime, I managed to avoid the more troll like denizens, and was able to nimbly skip past the teenage jakeys in Sauchiehall Street in plenty time to see Norwegian power / prog metallers take to the stage of the Garage. The first thing that took me by surprise was how packed the Garage was. Early starts often see a half empty venue but the crimped hair brigade were out in force, and it was a sweaty mess from the kick off. The crowd were definitely up for some epic metal sounds, and from the off Pagans Mind could do no wrong. It didn't take long for Nils K. Rue to get them singing, chanting and punching the air in unison. With a fine selection of widdly tunes, pounding riffs and some excellent air guitar from keyboard player Ronny Tegner, the crowd reaction was such that they could easily have filled the place by themselves. They rattled through an array of tunes, with the best reaction being saved for the new material, with 'Alien Kamikaze, in particular, being treated like an old friend. Although how Nils K. Rue can hit those high notes without doing himself a mischief remains one of lifes mysteries. It was all helped by an excellent sound, something often lacking at the Garage, and not even being squeezed into a postage stamp sized part of the stage could hold back the fire. The band seemed genuinely touched by the crowds reaction, and they'll be welcomed back anytime. You'll notice it's spelt "Northe". And they have the word warrior in their name. So there are no prizes for guessing that this is True Heavy Metal! The elderly relative of Battle Metal and all its various progeny But not Scandinavian. No, for once, True Heavy Metal! has returned to its spiritual home of Germany. Oddly, for a bunch of Germans, they have actually combined their rather splendid power metal based widdlings with hefty doses of Nordic mythology. Which is a bit coals to Newcastle, but there you go. I don't care, as this was a riotously enjoyable album, stuffed full of more metal cliches than you can shake a bullet belt at. And it's all the better for it. Stormwarrior have no truck with post this and that core, they simply want to beat you about the head with an abundance of foot on the monitor riffs and the opportunity to bang your head more than is medically good for you. So be prepared for whiplash when 'The Holy Cross' and 'Lion Of The Northe' some forth to slay thee. It's actually their third album, although my first encounter with them, and although I'm unlikely to spend much time hunting down their predecessors, this was an absolute treat. If you'd like your Battle Metal! mixed up with a wee bit Blind Guardian, then this will be a welcome diversion. Album number four from German metallers Headhunter. You know, the band bassist / vocalist Schmier formed when he left Destruction, before he went back to Destruction before he went back to Headhunter. Got that? Last year saw the first three Headhunter records getting re-released, and now a decade and a half after their last one, with Destruction on down time after last years "Thrash Anthems", they've gone and given us a new release to savour. Oddly, a lot of the material here would easily fit on a Destruction album, which isn't really how I remember Headhunter from the first time around. Back then, they were more influenced by classic eighties heavy metal, a sideways move from the thrash of Destruction. But with the sound of Destruction having broadened of late, and a thrashier edge to this new Headhunter album, the differences are blurred. Take a listen to 'Doomsday For The Prayer' and tell me otherwise, especially as Schmier always sounds like Schmier! But that aside, this is a thoroughly enjoyable album, chock full of galloping riffs, harsh vocals and rhythms designed to bang your head along to. With original Headhunters, guitarist Schmuddel and drummer Jorg Michael, in fine fettle, there is a life, verve and vigour to this release that is so often lacking in modern metal. The more 'rock' oriented songs, however, are the ones that really stand out. The slow, predatory 'Silverskull' and the out and out eighties gumby metal of 'Backs To The Wall' are the ones that will be getting revisited regularly. There are more than a few nods to the worlds of Accept and Running Wild dotted hither and thither, something that makes this old headbanger very happy indeed. Naturally, being a Headhunter album, that kerrazy, wacky Teutonic humour pops up now and again, as the album begins with the theme to "The Third Man", and we get their takes on the Skid Row classic '18 And Life' and the Judas Priest gem 'Rapid Fire'. Now, I'm not sure they were meant to be funny, but '18 And Life' certainly brought a smile to my face, although 'Rapid Fire' gets a more faithful reproduction. All the way through, it sounds like the band had an absolute blast making this record. Something that adds to the listening pleasure. If you've never heard what Schmier got up to on his holiday away from Destruction, then this could provide a very pleasant surprise. When the original version of this album came out I said it was an exceptional continuation of the Kamelot story and that it was destined to be one of the records of the year, an album that's required listening. Naturally, I was right, and if you disagree with me, then there's the door, out, you're barred. However, my well known antipathy to 'special editions' is, um, well known. So it's going to have to be pretty gosh darned special to escape from my withering, yet pithy remarks on the whole record company rip off shenanigans. But, Kamelot being Kamelot, they've gone and done it. How, I hear you ask? Well, they've only gone and included a whole new live album! Really! None of that two remixes and a video malarkey for them. Disc 2 of this set is a live set recorded in Belgrade, Serbia, called without a hint of affectation "Live From Belgrade". So, if you already have the "Ghost Opera", then you're still getting a brand new live album for your hard earned pennies. And the ten track live offering is a peach of an album in its own right. You even get the divine Simone Simons from Epica popping in to sing on 'The Haunting', a great song now made better. Still not convinced? Oh, alright then, they've even thrown in 3 studio tracks in the shape of 'Seasons End', 'Pendulous Fall' and 'Epilogue', with the first and last of those making a European / USA debut. And! Yes, I said and, a media player section comprising; 1 - Video of Memento Mori, 2 - Human Stain and 3 - Ghost Opera. There's also a new jewel case design with new cover and something called an embossed O card. Nope, me neither. Now this is an odd cove. A collaboration between Turkish power metal band Dreamtone and classical Greek singer Iris Mavraki, a fair amount of time, effort and money has gone into this, as the Philarmonia Istanbul Orchestra and special guests don't come cheap. And while it's all very impressive, I am left wondering if someone forgot to order the sprinkling of magic fairy dust that lifts the good into the realms of the great. Musically, it's a tried and tested route of fairly melodic power metal, which trickles over into the world of symphonic prog metal now and again, especially on the album highlight 'To Lose The Son' which sees Blind Guardian / Demons And Wizards' Hansi K�rch turning up for a vocal stint, alongside musicians Tom Englund from Evergrey, and Mike Baker / Gary Wehrkamp from Shadow Gallery. Elsewhere, there is an absolutely killer ballad in the shape of 'Everlasting Tranquillity', the trad power metal of 'Black Water' and the instrumental, orchestra led 'Transcending Miracle'. The band don't get too lost in the big picture and put in a good performance, although some of the songs are a bit generic, and could easily be any one of a number of bands. It's an ambitious undertaking and you have to applaud everyone involved for the care and effort that it's gone into it. 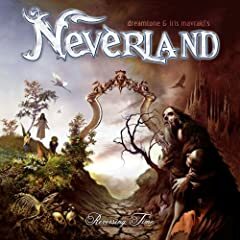 Fans of the genre will definitely enjoy it, and with the overall sag in quality of recent releases by major power metal acts, Neverland could scoop up some of their fans with ease. "Maniacal Renderings" was a cracking album, probably the finest of Jon Olivas post Savatage career. It saw him shaking slightly at the shackles imposed by his fan base, freeing himself up for something a little bit different. Well, this isn't it. Nope, this is actually a return to the days of "Poets and Madmen" and "Edge of Thorns". It's the Savatage album everyone has been wanting for the last seven years, just under a different name. Now this makes it either very good or very bad, depending on youor viewpoint. For old times sake, I'm going to side with the former. With the exception of 'Master', a very peculiar track, virtually any of these tracks would have sat happily on a Savatage album from back in the day, with 'Before I Hang' and 'Walk Upon Water', the highlights of a fine set. Oliva is in fine voice, roaring out of the speakers as befits the Mountain King, with well structured songs, classic arrangements and excellent performances from all including some guitar work from ex Deicide and Iced Earth fella Ralph Santolla on 'Adding The Cost' and 'You Never Know'. The epic this time around is 'Stories' which chucks just about everything including a backing chorus, twin guitar solos and an array of kitchen appliances into the mix. Even the ballads come up trumps with 'Open Your Eyes' a bit of a gem. It sounds as though Mr Oliva has come to terms with his past and settled down into giving the people what they want. And there's nothing wrong with that. Hey that's fun! Album number two from the Norwegian duo who are, so I am reliably informed, Polish sees them give the songs the same titles as on their full length debut, "Christendom Perished". So, it's another outing for 'Opus I', 'Opus II', 'Opus III', 'Opus IV', 'Opus V', 'Opus VI', 'Opus VII' and the catchily titled 'Opus VIII'. Which makes a change from the mini CD and 7" they put out a few years back which both featured the rather dull titles, Opus I', 'Opus II', 'Opus III', and 'Opus IV'. Comprising Nordra on six and four-string annihilation and screams, which makes him the singer / guitarist and Necrolucas on artillery of hell and warmongering, which makes him both drummer and criminal, they have taken their Marduk and Darkthrone influences and come up with an invigorating blast of black metal. For sure, they're not actually doing anything new, but new isn't a popular thing in the world of BM. Try any of that modern malarkey and you'll be cursed on forums the world over, by every virignal 14 year old BM boy. However, they do have one trick, and it's a very good one. They play fast and furious. Don't come here if you're looking for any of that girly symphonic BM nonsense. This is world of fast guitars and faster blastbeats. Having released their debut on Southern Lord, this album has been put out by Osmose, and props given, the production values have been stepped up (down?) a notch, emphasing the brutality of the musick, as they embark upon some Enthroned flavoured fury. There are a couple of moments in the middle of the album where you get to catch your breath, but otherwise it's frantic, hell for leather stuff with 'Opus III' probably the highlight. I had a blast listening to his, and fans of brutal BM should definitely check it out. I doubt whether Power Quest will ever quite shake off the baby Dragonforce tag. Understandably, what with past and present members of Dragonforce having done a tour of duty in the Power Quest ranks. However, Power Quest are now onto their fourth album and hopefully the lengthy bout of touring they did off the back of the preceding "Magic Illusion" album will have helped raise their profile. Let's start with the good stuff. There are some cracking keyboard driven prog tinged power metal tunes here. Although, be wary. On the best tunes like 'Human Machine', the prog influences seem to be winning out over the power metal. So if that makes the bile rise, steer clear. Me, I like it, and would be happy to see them heading off in that direction. On the down side, I still haven't taken to the vocals of Alessio Garavello, and if I haven't by now, I doubt I ever will. They just seem so lightweight next to the splendid music raging all around. However, some folks must rate him, and the music alone is strong enough to warrant a listen. Not to be confused with their 2005 EP of the same name, this is the debut UK release for Russian metallers Grenouer, although international travellers beware! This album has been knocking around in furrin parts since 2006. Since starting life as fairly standard death metal outfit waaaay back in 1992, they've evolved into a rather splendid techno metal band. Although, just to confuse things even further, the vocals retain the raw power of their death metal roots. Imagine Fear Factory with Deicides Corpsegrinder on vocals! As they should, after 16 years of playing, Grenouer are very good at what they do, and have put together an album chock full of memorable riffs and enough bleeps to keep the most hardened synth freaks pinned to the wall. There are even a couple of moments when they try and catch the wind, and attempt to make techno metal you can dance to. Those of you with weaker digestions may want to skip over 'Shut My Eyes'! If you prefer things considerably more, then try 'Devils Eye' or 'Powdering Squeeze, where the metal rules over the techno. 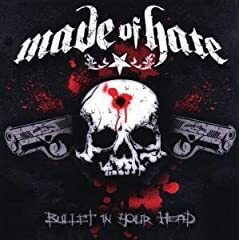 A quick, cursory glance around the interweb will reveal a howling of "rip off" hurled at Made Of Hate. Which is a wee bit on the harsh side. For sure, they share a number of stylistic similarities to Children Of Bodom, but only a couple of years ago the same naysayers were hurling the same abuse at Trivium for being Metallica copyists. Well, a helluva lot of people seem to be buying their albums and packing out their shows, so what's to stop Polands Mate Of Hate from doing likewise. So let's concentrate on the positive things for a moment. Guitarist Michal Kastrznski, for example, is absolutely amazing, firing off fabulous riffs, right, left and centre and he can also whip out a mighty solo when he needs too. And they're still a bunch of babbies with a lot of growing up to do. Do we decry Pantera for their early glam metal albums, or hail them as metal gods? So, if Made Of Hate are allowed room to grow and expand they could end up being a very good band indeed. Their sound is harsher than that of Children Of Bodom, taking in more death metal vocals, and some insanely fast drumming. The production is absolutely bang on, full ,rich and heavy as hell. The songs mainly have a power metal structure, and even though they don't stand out from the pack just yet, Made Of Hate have oodles of potential. So, ignore the internet abuse and give them a listen. You might be surprised. Blimey! He's really upset about something. But then NATO (the band) are beavering away in the teeny tiny whirlpool that is the metalcore / screamo marketplace, a world where the ability to get really, really annoyed about stuff is pretty damn essential. Of course, it only works if your testes have dropped and there's a manly tone to your caterwauling. Something that is somewhat lacking in the world of NATO. They've certainly been paying a lot of attention to their Killswitch Engage and Bring Me The Horizon record collections, and there are a plethora of mighty fine riffs that you may remember from their previous owners. On the plus side, they have welded on a decent set of melodies to the riffing, so that the kids won't get too scared by the angry manboys. They've also managed to make everything sound great, so kudos to the producer / engineer / studio. It's not a genre that is ever going to break out, so bands need an extra special killer tune to get the more mainstream metalheads perking up. NATO nearly have two. 'Thorns Without A Halo' comes ever so close to being a classic. But whiny manboy vocalist lets the Dimebag riff go to waste. 'The Last Goodbye' also powers in, all ripping attitude and rage, until it too falls apart in a morass of clashing styles. There's half a good band in here, struggling to get out, and if they can make themselves the dominant force, it might still go right. But this isn't it.